Host nation Russia advanced to the 2018 FIFA World Cup quarterfinals after defeating former champion Spain on penalties in their round of 16 game at Luzhniki Stadium on Sunday. The teams finished 1-1 after regulation and extra time, the first penalty shootout of the 2018 World Cup, and Russia goalkeeper Igor Akinfeev produced two pivotal saves to help his country win the spot kick battle 4-3. Spain took the lead early in the first half when Sergei Ignashevich inadvertently scored an own goal in the 12th minute. 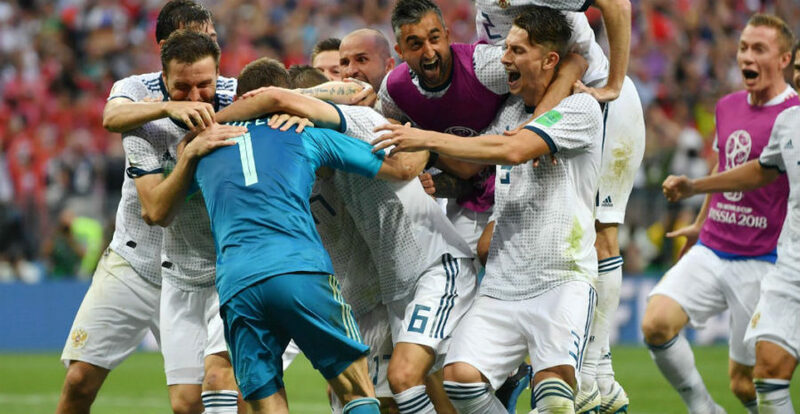 Under pressure from Spain’s Sergio Ramos, following a cross from a free kick, Ignashevich, unfortunately, saw the ball coming off his foot and beating Akinfeev. The 2010 champions bossed the ball game after the goal, but failed to add to the scoreline, which allowed Russia to get back into the contest. Artyom Dzyuba’s header off a corner kick struck the arm of Gerard Pique, who was also jumping with his back away from the ball. Despite protesting Pique and Spain failed to crack the referee and Dzyuba took the spot kick to send David de Gea the wrong way in the 41st minute to make it 1-1 at halftime. During the penalty kicks, Akinfeev saved penalty kicks off Koke and Iago Aspas to seal the win for the host. “We were hoping for penalties because Spain are hard to beat — Spain can’t always be lucky,” Akinfeev said. This is the first World Cup penalty shootout between two European teams since Italy beat France in the 2006 final. Spain played much of the game at a low tempo and made 1,1142 total passes, but had few attempts to attack into the Russian penalty area.